Polysaccharide vaccines account for about 30% of the total >$20-billion/year vaccine market. Despite efficacious vaccines in the field, diseases such as invasive Streptococcus pneumoniae and typhoid fever persist. 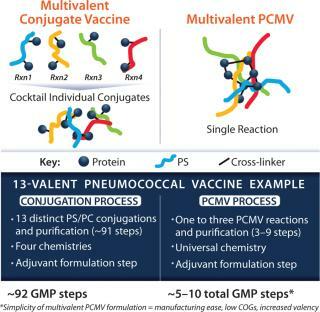 Development of multivalent polysaccharide conjugate vaccines requires complex chemistries and multiple, expensive good manufacturing practice (GMP) process steps. Matrivax Research and Development Corporation is developing a protein capsular matrix vaccine (PCMV) technology that simplifies synthesis of polysaccharide vaccines with fewer process steps than are required by typical conjugation vaccine processes. Pneumococcal vaccines account for a major part of the current polysaccharide vaccine market. S. pneumoniae infections lead to at least a million deaths annually worldwide. In the United States, the infection causes ∼3,000 cases of meningitis, 50,000 cases of bacteremia, 500,000 cases of pneumonia, and 7 million cases of otitis media. The 23-valent Pneumovax unconjugated polysaccharide vaccine (from Merck) was an early vaccine against S. pneumoniae. It was effective in the two to 50-year-old age span. However, many infants and the elderly still died of invasive pneumococcal disease because unconjugated vaccines were not effective in those populations. The current pneumococcal vaccine standard is the 13-valent conjugate vaccine Prevnar 13 manufactured by Pfizer. Prevnar 13 is highly efficacious in infants. The product reached US$3.72 billion in sales in 2012, with a worldwide market projected to $8 billion ($5 billion in low-to-middle income markets). Meningococcal vaccines are another major contributor to the polysaccharide vaccine market. Bacterial meningitis accounts for 170,000 deaths annually worldwide, with ∼3,000 cases per year in the United States. Meningococcal vaccines evolved in a similar pattern as pneumococcal vaccines. The first major product, Menomune (Sanofi) was an unconjugated group of four polysaccharides. It was introduced in the 1970s and was effective in two to 50 year olds, yet ineffective in infants. More recently approved conjugated products include Menactra (Sanofi) and Menveo (Novartis) that may confer protection to infants. Vaccines against enteric fever diseases are another segment of the polysaccharide vaccine market, accounting for about quarter of a billion dollars per year. Vaccines against Typhoid fever alone accounts for >$200 million. In combination with a vaccine against paratyphoid A, the market is projected to reach >$350 million. The current vaccines to combat Typhoid fever include unconjugated Vi polysaccharide commercialized by Sanofi (Typhim Vi) and GSK (Typherix). Alternatively, an oral, live-attenuated vaccine called Vivotif or Ty21a was commercialized by Crucell. PCMV technology is an alternative to typical development processes used in the synthesis of conjugate vaccines. Figure 1 contrasts a classic conjugate with the PCMV system. Conjugation is analogous to “catching a fish with a hook,” whereby the polysaccharide (fish) is “caught” or covalently bound by the protein (hook). 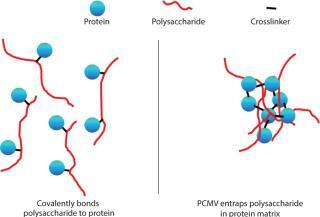 PCMV, is analogous to “catching fish in a net,” whereby the polysaccharide is entrapped by a “net” formed by the crosslinking of protein molecules. The benefit of PCMV technology is more evident in making a vaccine containing multiple polysaccharides, such as for pneumococcal or meningococcal disease vaccines. Figure 2 shows a schematic of a quadrivalent meningococcal vaccine using conjugate and PCMV technology. For a conjugate vaccine, a chemical process links protein (spheres) to polysaccharides (colored lines). This linking may require different chemistries for each polysaccharide. For example, at least four different chemistries are used to make the 13 conjugates of the Prevnar13 vaccine. To make the multivalent vaccine, the 13 individual conjugates are then mixed together. PCMV technology requires only a single chemistry to “catch” many different polysaccharides in the same “net” (Figure 2, RIGHT). With PCMV technology, we aim to provide a simpler technology with fewer process steps so that vaccines can be distributed to less-developed countries quickly and inexpensively. Table 1 compares the typical number of good manufacturing practice (GMP) process steps. A typical 13-valent conjugate product process requires 13 distinct chemistries or conjugation reactions. Whereas, with PCMV technology, a single chemistry and a reduced number of reactions would be used, thus reducing the total number of GMP steps. The PCMV process is also readily adaptable to adding additional polysaccharides to the formulations to provide for widespread coverage and improved breadth of protection. The current trend has been toward the development of vaccines including a greater number of serotypes. For example, seven original serotypes (4, 6V, 9B, 14, 18C, 19F, and 23F) were represented in Prevnar7, which was commercialized in 2000 by Wyeth. GlaxoSmithKline was on the heels of Wyeth with Synflorix, a 10-valent vaccine (additional serotypes 1, 5, and 7F). The state-of-the-art pneumococcal vaccine Prevnar13 contains three additional polysaccharide serotypes (3, 6A, 19A). Recently, Merck has announced a 15-valent pneumococcal vaccine that is currently in phase 2 clinical trial development. Matrivax is demonstrating PCMV technology proof of concept through two different pathways. Although the best application for PCMV technology is to manufacture a multivalent pneumococcal vaccine, making a 23-valent pneumococcal vaccine is much beyond the capacity of our 11-person company. So the pneumococcal program is at a preclinical level at this point, and we are actively talking to potential partners. We can, however, make a GMP monovalent typhoid fever vaccine because that is something Matrivax can realistically bring to Phase 1 clinical trial stage to showcase the PCMV platform technology. After Matrivax licensed PCMV technology from Harvard University, we discovered about a year and a half ago that adding proprietary polycations to the matrix had a profound effect on the formation and immunogenicity of PCMV particles. Polysaccharides are generally anionic in nature, so if you mix them together, they don’t necessarily go to the same part of the reaction vessel as the CRM197 Matrivax protein. The addition of polycations to the soluble preformulation mixture reduces some negative charge and enhances entrapment and facilitates polyprotein capsular matrix vaccine formation. In addition, including polycations in the PCMV formulation had a very strong impact on immunogenicity. Multivalent Experiment: Matrivax conducted different pneumococcal experiments with different permutations of polysaccharides. We synthesized trivalent, quadrivalent, 23-valent, and 13-valent vaccines in single PCMV reactions. For one trivalent formulation, we selected three pneumococcal polysaccharides that are represented in Prevnar: Serotype 4, 18C, and 23F. We used CRM197, which is the same carrier protein used in most conjugate vaccines, as the matrix protein. The immunogenicity of the trivalent PCMV was then compared with Prevnar in mice. At a 2 µg dose of each polysaccharide, the PCMV elicited an antiserotype 4 IgG GMT (geometric mean titer) of 885,000 compared with an 80,000 IgG GMT induced by immunization with Prevnar. For 18C, a GMT of 76,000 was induced by PCMV compared with the titer of 3,000 induced by Prevnar, whereas for 23F, the GMT elicited by the PCMV was about 20% lower than immunization with Prevnar. Thirteen-Valent Experiment: Based on the promising results from the trivalent PCMV, our board of directors asked whether all 13 polysaccharide constituents of Prevnar13 could be entrapped in a single PCMV reaction and achieve titers that approached those of Prevnar. The PCMV, which included a polycation to assist in matrix formation, elicited a superior immune response to Prevnar 13 for three of 10 polysaccharides, comparable for two polysaccharides, and inferior for five. The Prevnar dose, however, was ∼2 µg per antigen of polysaccharide, while the PCMV was much lower at ∼0.3 µg of polysaccharide. Subsequent quadrivalent and 23-valent PCMV also elicited superior immune responses over Prevnar for several polysaccharides. In the tri- or quadrivalent PCMV results, superior immunogenicity over Prevnar was observed for the same four serotypes. However, for the 13-valent and 23-valent PCMVs, several of the polysaccharides showed dissimilar results. Of the 10 polysaccharides for which we have assessed specific IgG responses, PCMV particles were superior immunogenically for six of them compared with Prevnar in a mouse model. This is the current state of the art for PCMVs application to pneumococcal disease. Typhoid Experiment: A vaccine to Typhoid fever is a good initial target for PCMV technology because the current state-of-the-art vaccines are Typherix sold by GSK or Typhim Vi (sold by Sanofi), both of which are an unconjugated Vi polysaccharide. Both vaccines are licensed for only two-year-olds and older. To test whether the Vi polysaccharide from Salmonella enterica serovar Typhi could be entrapped in a PCMV, we synthesized a PCMV using our proprietary cation and CRM197 as the matrix protein then compared its immunogenicity in mice to the current Typhim Vi vaccine. A 10 µg TyphimVi dose in mice resulted in an anti-Vi IgG GMT titer of 1,600 after a three-dose regimen. The Vi-PCMV adjuvanted with alum elicited anti-Vi IgG GMT titer of 65,302, a ∼40-fold increase in anti-Vi antibody titers compared with using Vi alone. With those promising Vi PCMV preclinical data, we moved toward a clinical pathway where we partnered with Haikou VTI Biological Institute, a Chinese vaccine development company. Under this alliance, R&D was conducted in Boston. Scale-up and process development were performed at Haikou VTI, where batch production records (BPRs) and standard operating procedures (SOPs) were written. The scaled up process was then transferred back to the United States to our US contract manufacturing partner to follow a US path to licensure and commercialization. Three components make up our vaccine. We commissioned the Pilot Bioproduction Facility at Walter Reed Army Institute of Research (WRAIR) to produce and purify Vi polysaccharide from S. enterica serovar Typhi at large scale. CRM197, our universal carrier or matrix protein, is from Pfenex. We contracted with a CMO to manufacture the proprietary cation. The three components were used to synthesize a Vi-PCMV at WRAIR. The product has passed sterility and endotoxin, and many other release assays are ongoing. We are planning to initiate an FDA-regulated Phase 1 clinical trial in 2014, immunizing 18–40-year-old healthy volunteers with a Vi PCMV. We’re looking at a 3:1:1 ratio of the Vi-PCMV to placebo to Typhim Vi to gauge how it compares to tolerability and immunogenicity with the current commercialized vaccine. We have evidence in mice that the Vi-PCMV elicits an anamnestic or memory response. Six months after giving an initial series of vaccinations, we observed a rapid rise in titers three to four days after giving a booster immunization. Matrivax scheduled a pre-IND meeting with the FDA to get feedback on our synthesis and manufacture process, our toxicology study design, and method to determine immunopotency of the Vi-PCMV. We’ve proposed an in vitro immunopotency study as opposed to a costly in vivo potency study. We also want the agency to provide feedback on our release and stability studies as well as our clinical design before we move forward. In summary, we licensed PCMV technology from Harvard Medical School. Subsequently, Matrivax discovered that using polycations in the PCMV reaction boosts polysaccharide entrapment efficiency and bolsters the immune response. Preclinical murine immunogenicity studies demonstrated that polysaccharide specific IgG titers rise as much as 40-fold above polysaccharide alone with PCMV. We have successfully synthesized the components for a Vi-PCMV and have recently made PCMV particles for our Vi program. For our multivalent pneumococcal PCMV, we have achieved very good immune responses for bundles of serotypes ranging from trivalent to 23-valent. We hope the simplified PCMV process will ultimately give us a multivalent pneumococcal vaccine that will confer protection to 95% of the world population. Corresponding author Kevin P. Killeen, PhD, is chief scientific officer, Thomas J. Griffin, PhD, is research director, Robert T. Cartee, PhD, is associate director, and Ann Thanawastien, PhD, is associate director at Matrivax Research and Development Corp. Boston, MA. Protein capsular matrix vaccine (PCMV) technology (virtual conjugation) is exclusively licensed from Harvard Medical School. Excellent initiative to make polysaccharide based conjugate vaccines simple and economical. it seems this approach will also reduce the cost of analysis. Truely optimistic to see a day when people would opt for PCMV in place of conjugate based multivalent vaccines. It would be great if I get updates in the research on my mail ID mentioned above.